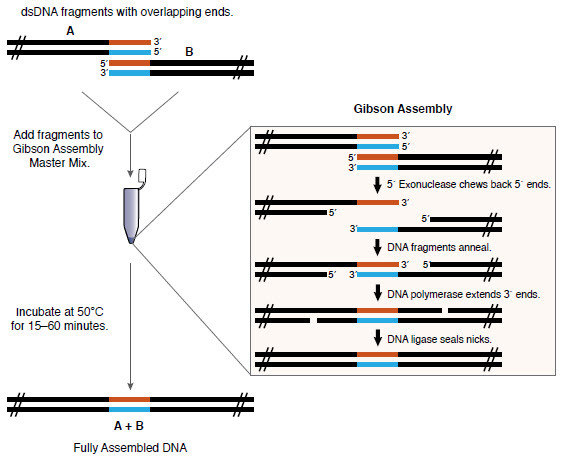 Gibson Assembly allows for successful assembly of multiple DNA fragments, regardless of fragment length or end compatibility. The exonuclease creates single-stranded 3´ overhangs that facilitate the annealing of fragments that share complementarity at one end (overlap region). The polymerase fills in gaps within each annealed fragment. The DNA ligase seals nicks in the assembled DNA. The end result is a double-stranded fully sealed DNA molecule that can serve as template for PCR, RCA or a variety of other molecular biology applications, including direct transformation. The method has been successfully used by Gibson’s group and others to assemble oligonucleotides, DNA with varied overlaps (15–80 bp) and fragments hundreds of kilobases long (1–2). For help designing primers, please view our primer design video. 10 μl of 2X Gibson Assembly Master Mix was incubated with 6 fragments (5 fragments of 400 bp and one of 2,780 bp, with 40 bp overlap, 0.05 pmol each) in a final volume of 20 μl at 50°C for 60 minutes. NEB 5-alpha Competent E. coli (NEB #C2987) were transformed with 2 μl of the master mix/fragment mixture using the transformation protocol. Greater than 100 white colonies were observed when 1/10 of the outgrowth was spread on an ampicillin plate with IPTG/Xgal and incubated overnight. PCR amplify fragments using a high-fidelity DNA polymerase. Prepare linearized vector by PCR amplification using a high-fidelity DNA polymerase or by restriction digestion. Add DNAs to Gibson Assembly Master Mix and incubate at 50°C for 15 minutes to 1 hour, depending on number of fragments being assembled. We recommend Q5® High-Fidelity DNA Polymerase (NEB #M0491) or related products, such as Q5 Hot Start Flex DNA Polymerase (NEB #M0493), Q5 Hot Start Flex 2X Master Mix (NEB #M0494). LB (Luria-Bertani) plates with appropriate antibiotic. SOC Outgrowth Medium (NEB #B9020). We recommend NEB 5-alpha Competent E. coli (High Efficiency, NEB #C2987). For assembled products greater than 10 kb, NEB recommends using NEB 10-beta Competent E. coli (High Efficiency, NEB #C3019) or NEB 10-beta Electrocompetent E. coli (NEB #C3020). Store at -20°C. Thaw, vortex thoroughly before use and keep on ice. We highly recommend using our web tool, NEBuilder™ to design PCR primers with overlapping sequences between the adjacent DNA fragments and for their assembly iinto a cloning vector. Cells: Transformation efficiency of competent cells can vary by several logs. Perceived assembly efficiency directly correlates to the competence of the cells used for transformation. Electroporation: Electroporation can increase transformation efficiency by several logs. When using the Gibson Assembly Master Mix product for electroporation, it is necessary to dilute the reaction 3-fold and use 1 μl for transformation. DNA: PCR product purification is not necessary if the total volume of all PCR products in the Gibson Assembly reaction is 20% or less of the Gibson Assembly reaction volume. Higher volumes of PCR products may reduce the efficiency of Gibson Assembly and transformation due to the elevated carryover amounts of PCR reaction buffer and unused primers present in the PCR product. Column purification of PCR products may increase the efficiency of both Gibson Assembly and transformation by 2–10 fold and is highly recommended when performing assemblies of three or more PCR fragments or assembling longer than 5 kb fragments. Purified DNA for assembly can be dissolved in ddH2O (Milli-Q® water or equivalent is preferable), TE or other dilution buffers. Insert: When directly assembling fragments into a cloning vector, the concentration of assembly fragments should be 2–3 times higher than the concentration of vector. For assembly of 3 or more fragments, we recommend using equilmolar ratio of fragments. Gibson, D.G. et.al (2009). NatureMethods. 343-345. Gibson, D.G. et al. (2010). NatureMethods. 901-903. Barnes, W.M. (1994). Proc. Natl. Acad. Sci.. 91, 2216-2220. How large a DNA fragment can I assemble? Can ssDNA oligonucleotides be combined and assembled with dsDNA fragments? Can I use a 15-nt overlap that is entirely composed of His-tag repeats (i.e. CACCACCACCACCAC)? Can you PCR-amplify the assembled product? Are there any differences between the Gibson Assembly Master Mix (NEB#E2611) and Gibson Assembly Master Mix included in the Gibson AssemblyCloning Kit (NEB #E5510)? Are there any differences between the requirements for 2-3 fragmentassemblies versus 4–6? The Gibson Assembly Master Mix control reaction is not giving me any colonies. Why? When using a polymerase that doesn't contain a 3'-5' exonuclease activity (such as Taq DNA Polymerase) to amplify fragments to be used in a Gibson Assembly reaction, should I be concerned about the potential 3' mismatch generated by the addition of a non-templated nucleotide? Is storing Gibson Assembly Master Mix at -80°C harmful? I would like to use NEBuilder but am concerned about user data privacy. How does NEB handle the information that I enter into NEBuilder? Limited Warranty: The Gibson Assembly® Master Mix and Gibson Assembly Cloning Kit are warranted to perform according to specifications stated on the certificate of analysis. No other warranty is made, whether express or implied, including any warranty of merchant ability or fitness for a particular purpose. This warranty limits NEB’s and its licensors’ liability to only the price of the product. Neither NEB nor its licensors shall have any responsibility or liability for any special, incidental, indirect or consequential loss or damage whatsoever.